New Orleans Saints quarterback Drew Brees (9) has guided the Saints to four consecutive wins and first place in the NFC South. 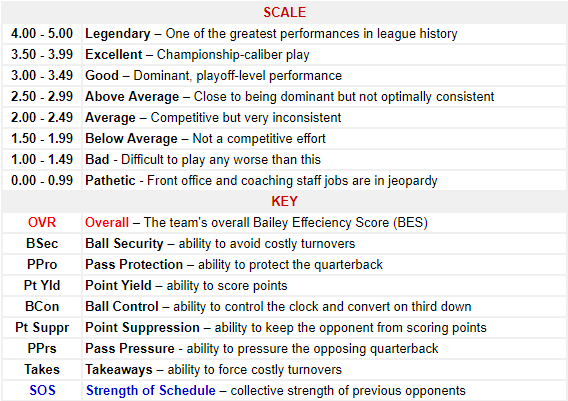 As we approach the midway point of the season, our Week 7 BES rankings are a reminder that the BES gauges overall momentum among other factors. Therefore, we recommend our readers view the BES more as a thermometer that measures the heat of all 32 teams and ranks them accordingly. This will give an idea of why we have a new No. 1 team atop our rankings this week and it’s likely not who many thought it would be. 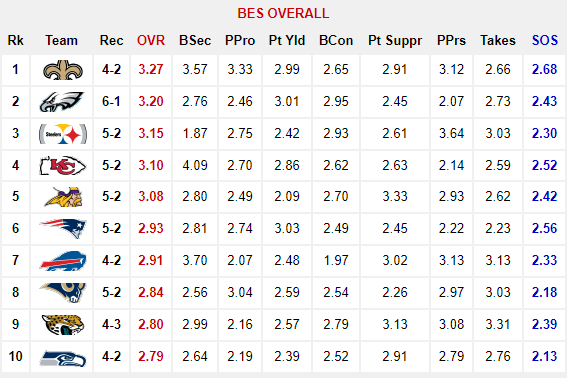 The BES was 11-4 (.733) predicting Week 7 outcomes based on our Week 6 report. That brings our season total to 52-39 (.571) in terms of accuracy. Among those four failed predictions was the Oakland Raiders (3-4) stunning 31-30 upset of the Kansas City Chiefs (5-2) last Thursday night. 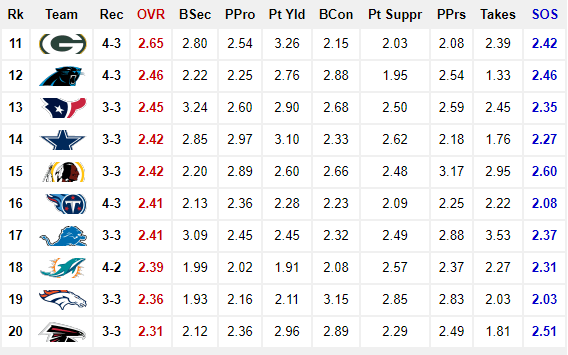 The loss was the second in as many weeks for the Chiefs and ultimately ended their five-week reign atop our rankings. Saints take over at No. 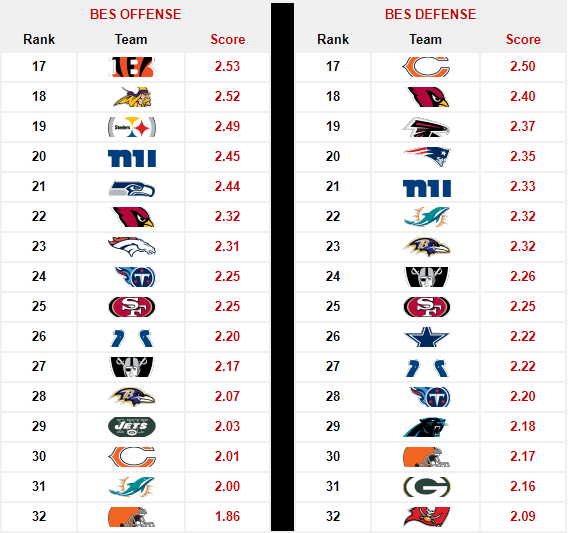 1 in our Week 7 BES Rankings, surging past the Pittsburgh Steelers (5-2) and Philadelphia Eagles (6-1) – a pair of teams whom many would argue have a stronger claim to the top spot. However, among teams in this week’s top-5, the Saints are the only one that has won four straight games with three being on the road and arguably favored in none. 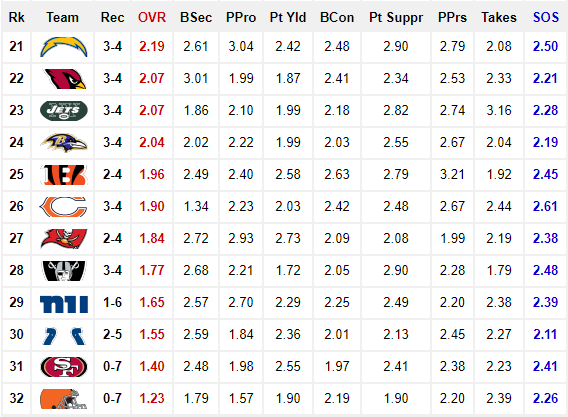 Furthermore, the Saints have the highest Strength of Schedule (SOS) among all 32 teams in this week’s report. 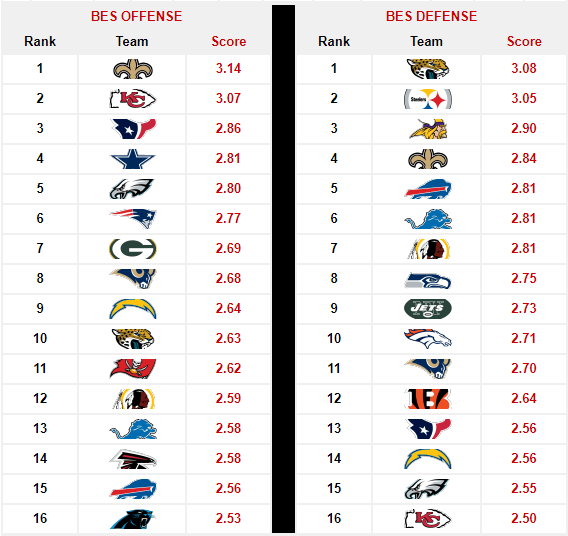 Also, they’re the only team to rank amongst the top-5 in both BES Offense (No. 1) and BES Defense (No. 4). We’re sure the question remains whether or not they’re for real. Only time will tell. For now, we know they play three of their next four games at home. That’s a highly favorable stretch for a hot team hoping to remain atop a volatile NFC South.